Cultural Property Repatriation News and Issues: International Colloquy. 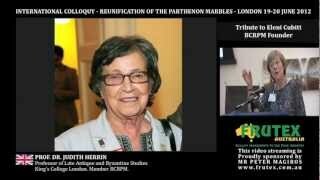 Reunification of the Parthenon Marbles. International Colloquy. 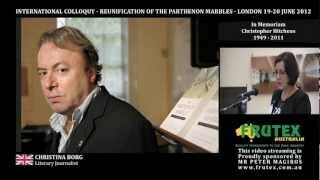 Reunification of the Parthenon Marbles. 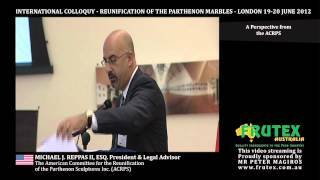 The International Colloquy, "Reunification of the Parthenon Marbles" (19-20 June 2012) was held in the Hellenic Centre, and was attended by leading representatives from four continents. It was timed to coincide with the third year anniversary of the opening of the new Acropolis Museum and the occasion of the 2012 London Olympics one month later. 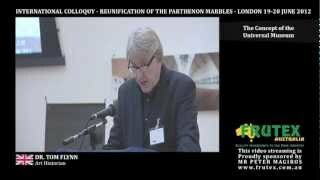 Co-presented by The British Committee for the Reunification of the Parthenon Marbles (BCRPM), The American Committee for the Reunification of the Parthenon Sculptures (ACRPS), and The International Organizing Committee -- Australia -- for the Restitution of the Parthenon Marbles (IOC-A-RPM), the 2012 international colloquy echoed the efforts around the globe to educate and connect people and resources. By forging an open dialogue and coalitions among supporters, the organizing committees hope to further increase the level of awareness and support around the world. The event will be held annually and Sydney (Australia) was announced as the host of the 2013 instance (late October - early November 2013). Now 17 videos of the 2012 proceedings are available online (the streaming of the Colloquy's proceedings was made possible thanks to the generous sponsorship of Mr Peter Magiros and Frutex Australia). Editor: Dennis Tritaris, Orama Communications, Sydney. Keynote speaker was the world-renowned human rights advocate and author, George Bizos SC, a Member of BCRPM and lawyer to Nelson Mandela, who spoke on issues relating to litigation. Among the other topics presented included the concept of the "Universal Museum", issues of litigation, the Acropolis Museum, archaeological perspectives, and special tributes to Eleni Cubitt, founder of the British Committee for the Reunification of the Parthenon Marbles, and the late journalist, Christopher Hitchens, a friend and supporter of the Committee. I thought the presentation by Dr Tom Flynn exceptionally good, and would urge all readers to listen to what he says - and how he says it - attentively. Brilliant. 7:25 Eddie O'Hara (UK). 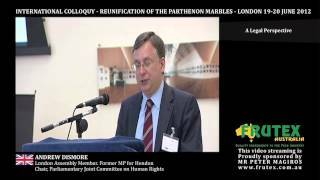 Chairman of The British Committee for the Reunification of the Parthenon Marbles (BCRPM) "Chairman's Welcome and Opening Remarks". 26:49 Michael J. Reppas II, Esq (USA) President and Legal Advisor. 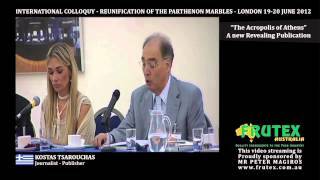 The American Committee for the Reunification of the Parthenon Sculptures (ACRPS) "Reunification of the Parthenon Marbles. A Perspective from the ACRPS." 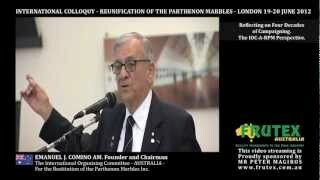 22:44 Emanuel J. Comino AM (AUS) Founder and Chairman of The International Organising Committee - Australia - For the Restitution of the Parthenon Marbles (IOC-A-RPM) "Reflecting on Four Decades of Campaigning. The IOC-A-RPM Perspective". 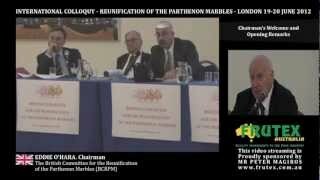 26:20 Eddie O'Hara (UK) Chairman of The British Committee for the Reunification of the Parthenon Marbles (BCRPM) "A Perspective from the BCRPM"
Then comes the keynote address from George Bizos (Human Rights Advocate - Author, Member of BCRPM). 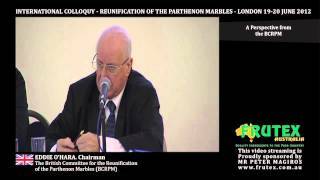 He spoke quite emotionally on on the Reunification of the Parthenon Marbles and "issues relating to litigation" and the meaning of the Marbles to Greece. 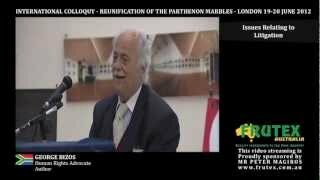 16:45 George Bizos (RSA) "Reunification of the Parthenon Marbles. Issues Relating to Litigation". The next presentation was an important and informative breakdown of the legal status of the Marbles, and why this is less a legal question than a moral one. Well worth listening to. Then a rather long-drawn presentation by a proud publisher (in Greek, translated by his daughter) of a special bibliophillic edition of facsimile reproductions of 21 unpublished texts that document the earliest (1834-1841) claim for the return of the Parthenon Sculptures and the use the publisher intends to make of it to promote the Marble-repatriation cause. 21:51 Kostas Tsarouchas (GRE). The Acropolis of Athens. A New Revealing Publication. 5:46 Prof. Dr. Judith Herrin (UK). Tribute to Eleni Cubitt.